Today, Thursday, our colleagues at 7News shared video footage with Amandala, which seems to confirm those rumors of police contrabandistas. 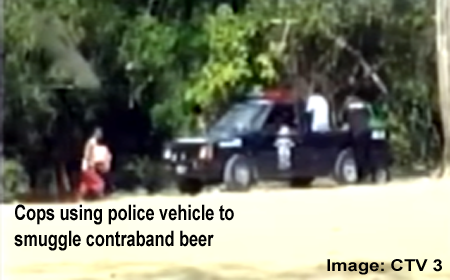 In the footage, men in plain clothing, believed to be cops, are seen carrying bundles of suspected contraband beers from the Mexican side of the border. Once on the Belize side of the border, the men could be seen handing the bags to a man in the back of the police truck, who then carefully arranged them. All this occurred in broad daylight, a stone’s throw away from the Orange Walk Customs Office and in front of Belizean civilians who recorded it on their cell phones. When 7News pressed Police Commissioner Allen Whylie for answers, he conceded that he had also heard the rumors, but never saw the actual footage. According to our sources, this footage had been forwarded to senior officers in Orange Walk who have been able to positively identify the officers. When the media asked the Police Press Office if any disciplinary measures had been taken, Assistant Commissioner of Police (ACP) Chester Williams revealed that no action has so far been taken against the men. ACP Williams mentioned that Commissioner Whylie had directed the Professional Standards Branch (PSB) of the police to investigate the matter. Information to our newspaper, however, is that this footage had also been forwarded to the PSB weeks ago, and nothing has been done.